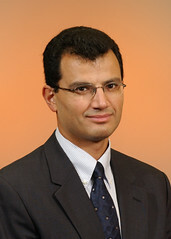 Dr. Erhan Kutanoglu earned his Ph.D. in industrial engineering from Lehigh University in Pennsylvania in 1999. He joined the faculty of The University of Texas at Austin in 2002. He received a Faculty Early Career Development Award from the National Science Foundation that same year. Dr. Kutanoglu specializes in applied operations research regarding manufacturing and service logistics and supply chain management. He develops solutions to service logistical problems where repairing, recycling and stocking of parts provides after-market service to geographically-dispersed customers. This research allows manufacturing companies and the U.S. military to achieve cost savings through better decision-making in warehousing and distribution, which increases overall service readiness and minimizes costs. He is also collaborating with other college professors to streamline semiconductor manufacturing. The manufacturing time (or “cycle time”) for semiconductor wafers is typically about 10 to 12 weeks, but they only require 2 weeks to actually process. Kutanoglu’s goal is to reduce disruptions of overall plant performance by developing models for them. To develop his models, he uses mathematical modeling as well as game theory. He hopes to develop a unifying theoretical framework that encompasses both fields and connect the system-level optimization with the distributed decision structure.